Father and son Shane and Mike Dooley fish for mullet. Third generation Pine Island commercial fisherman and seafood producer Michael Shane Dooley said the main mullet run in southwest Florida is from Thanksgiving to the first of January. Father and son Shane and Mike Dooley cast for mullet. 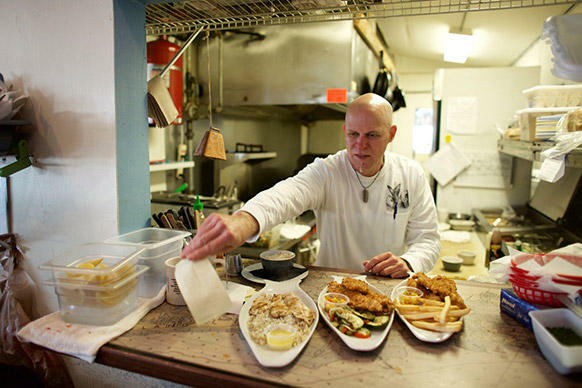 “It’s got a bad rep from day one,” said commercial fisherman Donald Sawyer. He described the ways dealers like Pinellas Seafood have tried to fight that bad reputation by, for example, changing the name of mullet to Lisa. “They tried pickling it. They tried canning it. And there’s still some of that being done around. But it’s on a very small scale. But people just don’t get to try to give it a chance,” said Sawyer. Starfish Company owner Karen Bell said she doesn’t understand why people consider mullet a “trash” fish. “I don’t know who started that nasty rumor, but they’re wrong because it’s inexpensive compared to your offshore species, and it’s actually probably better for you because it’s got that higher oil count,” said Bell. To understand why some business owners are working to change mullet’s reputation you have to understand how it’s regulated in Florida. Associate vice president of research at Mote Marine Laboratory in Sarasota, Ken Leber, said some of the first rules began in 1989. “We began to see some of the first rules for the sizes of mullet that could be caught, the quotas on how many could be caught, and for a long while there was even a restriction on fishing on the weekends for mullet in Florida,” said Leber. 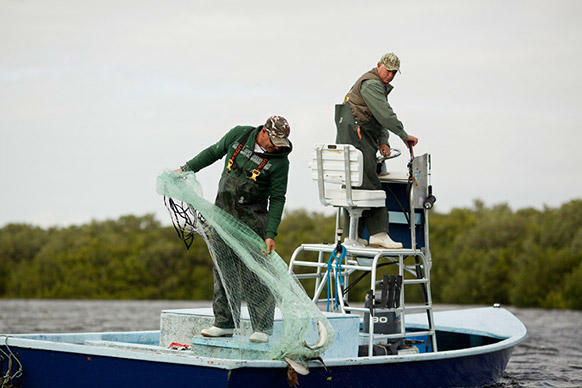 Leber said once a Constitutional Amendment banning entangling nets and gill nets took effect, the mullet fishery dropped down from about 26 million pounds a year, to 6 to 7 million. It eventually stabilized at around 8 to 9 million pounds a year on the west coast of Florida. “Right now, the biological sustainability of the fishery is pretty good,” said Leber. “The gill net ban helped the mullet fishery. 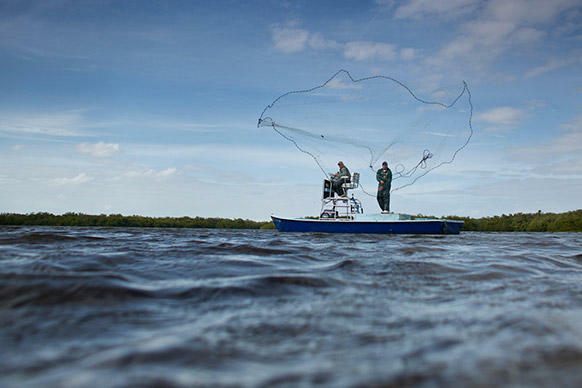 The problem is they didn’t think about the fishermen,” said Christopher Cogan, CEO of Healthy Earth which is building a mullet processing plant in Sarasota. Healthy Earth began a mullet improvement project last year which would do a number of things to help the local industry, including making mullet roe, or what’s known internationally as bottarga. Cogan says they will also buy the male mullet from anglers. Males are often discarded. Mullet roe or egg sacks. Cogan’s business partner, Seth Cripe, founded Healthy Earth and Cortez Bottarga on Anna Maria Island. It’s the first company in the US to produce roe from grey striped mullet. 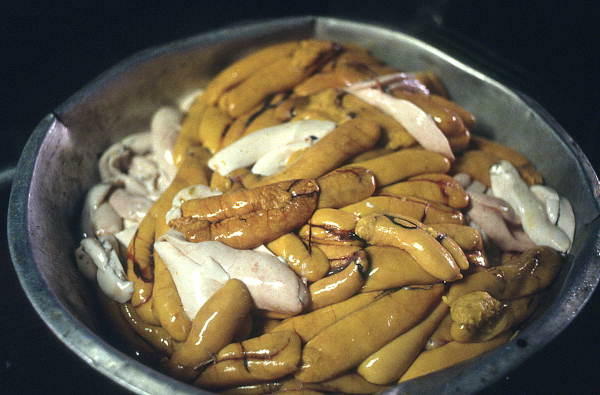 Cripe was first introduced to bottarga at a high-end restaurant when he lived in Napa Valley, California. “The waiter came over for one of the courses and had this piece of mullet roe and grated like parmesan cheese over this pasta course and said this is salt-cured mullet roe from Sardinia, from Italy,” said Cripe. “It’s a very rare delicacy. And so immediately like this light bulb went off to me. And I called my friends that night and I was telling them like I just had this product at this great restaurant out here, one of the best in California and one of the best in the world. And we’ve got to make this here, like they told me they pay $300 a pound for it,” he said. Cripe returned to southwest Florida that year in 2009 and started experimenting how to salt-cure and produce bottarga within a month. He said it was a lot of trial and error. It took three years but they found a high end distributor from New York. “The whole plan was always to brand Florida Gulf Coast mullet roe, produce it here, add the value here, pay the fishermen more money, create jobs, create a sense of community around the industry and preserve the industry for the future,” said Cripe. Things are changing now for some folks in the industry. Pelican Point Seafood fish house manager Amy Wirtz said an average mullet day brings in about 20,000 pounds. Wirtz said her company bags the fish, puts them on ice and ships them off to processors all over. Cripe said Cortez Bottarga uses distributors in the more food progressive cities such as San Francisco, New York, Nashville, New Orleans and Chicago. Florida, he said, is coming along. Chef Jesse Tincher, Owner of Blue Dog Bar and Grill in Matlacha, FL. Go here to watch the WGCU-TV documentary “Mullet: A Tale of Two Fish” where you’ll also find mullet history, videos and recipes.